This is another Iberian dish – the word 'barbecue' comes from the Spanish barbacoa, a structure upon which meat would be roasted. Slash the chicken, without going through to the bone, and place in a large dish. Mix the remaining ingredients together, pour over the chicken, cover and refrigerate for at least 4 hours, or overnight. Remove excess marinade from the chicken, then cook the chicken on a hot barbecue or under a hot grill for about 8–10 minutes each side, or until cooked through. Meanwhile, pour the leftover marinade into a saucepan, and boil until reduced to a thick sauce. Serve the chicken with the sauce and plain boiled rice. 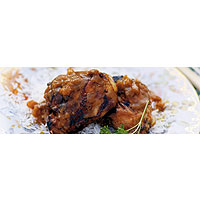 A light, sour, cherry-infused red will add another level of spiciness to this chicken dish.